Bodies in Flight in their 17th performance project GYMNAST delved into our fascination with the athlete’s drive to physical excellence, their supreme attention to bodily task, the high point on the parallel bars, the thousands of minute adjustments needed to hold that still. In collaboration with video-artist Tony Judge and composer Jen Bell and Night Bus Choir, GYMNAST used the training session as both source and structure, from warm-up routines to the display of gymnastic exercises, from novice to expert, to explore the continuing power of the Olympian ideal of athlete as interface between human and superhuman, the mortal and the divine. This project responded to the 2012 Games by exploring the athlete’s drive and determination to acquire the skills necessary to achieve physical excellence, both from the insider’s point of view – the trainee gymnast, and from the spectator’s – the admiration we feel in watching the achievement of physical mastery. Using the gymnast’s training session as both source and structure, moving from basic warm-up routines to the display of gymnastic exercises, we developed a micro-choreography revealing the beauty of the gymnast’s supreme attention to bodily task, placed alongside new writing set to music and sung by a choir. In parallel, video-maker Tony Judge created the video consisting of interviews and sequences capturing the training regime and micro-choreography of the gymnasts’ movements. The work was presented in various forms: as multi-screen video installation, sometimes with live gymnastics and/or live choir; as theatre performance or a gymnasium presentation. 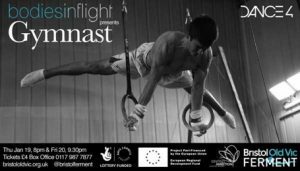 Four videos were selected by the BBC for their Big Screens contribution to the Cultural Olympiad and shown at 22 locations nationwide in the run-up to the Games.